How do I check disk usage? How do I check disk usage across packages in My20i? 20i allows you to easily check and monitor disk usage across all your packages and sites within your My20i account. There are no limits on disk space for Resellers. However, you may want to limit what your clients can use. 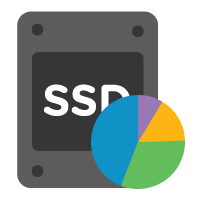 The Disk Usage Report allows you to keep track of what resources are being used. Head to the Reporting section on the home page and select Disk Usage. You’ll see a full list of all your packages and their respective disk usage as well as the percentage used of the quota you’ve set for that package.